Well, I was going to mow today, but it's looking pretty unlikely now. The weather report said clear skies and sun for the rest of the week, so I watered the trees yesterday with a deep watering, figuring that the ground would dry out enough for me to mow today... then this morning it rained for two solid hours. The ground is soaked. The grass is too wet to mow now, and I'm not sure it'll dry out before this evening. Oh well, at least I can still get a few pictures, right? 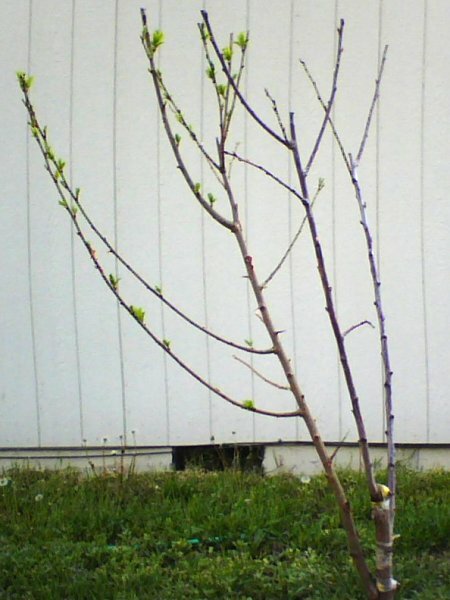 I'll start today off with a before-the-cut picture of the grafted plum, which shows the leaves on the Santa Rosa bit. 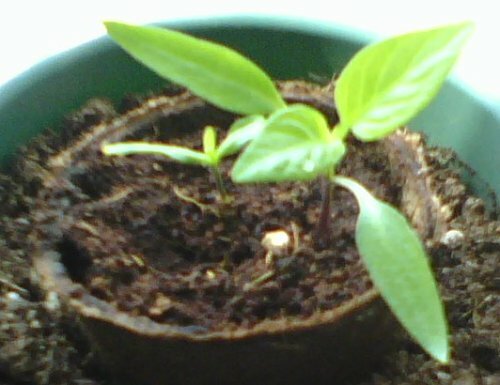 The other two grafts look rather barren until you get a nice close up, which I'll put after the cut. 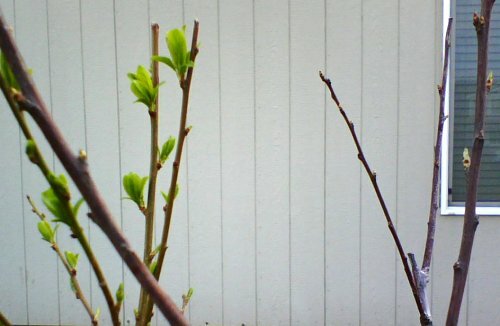 You might be able to see in this picture that, while the Santa Rosa graft is leafing right up, the other two grafts at least have buds growing out. 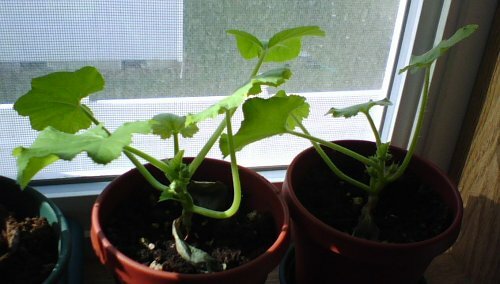 I kind of suspect that I'll be taking pictures of leaves by next week on both the other grafts. The branch in front of the Santa Rosa is the "Sugar" graft, and the one in front of the window is the Italian graft. 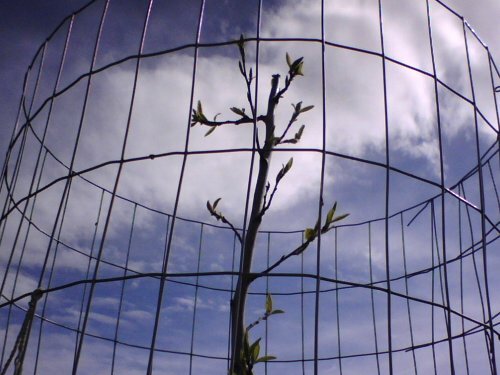 The above is yet another somewhat dramatic picture of the plum stick, showing the leaves that hadn't yet sprouted in last week's dramatic picture. There are still a couple of blossoms further down on the tree, but they look rather pathetic and lonely, and I'm not sure they met with any of the local bees for pollination. Since I'm not expecting fruit for at least five years, I'm not too worried. 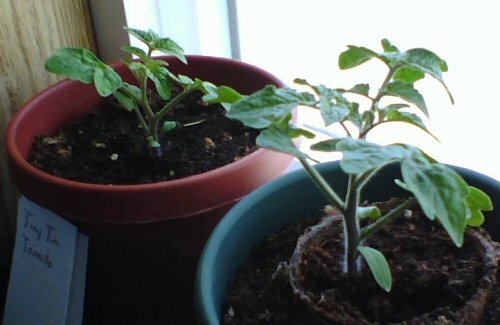 And here are the Tiny Tim Tomato Seedlings, both much bigger than last week. At this rate, I'll have to replant them sooner rather than later. Speaking of replanting, the neighborhood cats have managed to get rid of part of the bird netting I put down, and have made a section of my garden plot into their bathroom again. This calls for tougher measures, I'm just not sure what those measures will be yet. Pity I don't have the money or know-how to make a motion sensor that can spray the cats when they get in my garden area. I suspect I will have to be more creative with the bird netting (and get some more ground staples so I can arrange it a little differently. Next up are the peppers, which are growing very nicely now. I need to figure out how to transplant one of them soon. I have an idea how to do it, but I wish I had more windowsill space and another pot. As it is, I'm going to have to make room for the zucchini soon somehow. They are growing just too fast! Ahem, right peppers... the leaf uncurled completely on the zombie one that I was sure had died, and the leaves on the bigger one are spreading dramatically. The Moneymaker tomatoes (aka Triffids) are growing well, although you might not be able to tell as this is a side shot and last week's was a view from above. My friend has agreed to take one of these, and one of the zucchini, so they will both have a nice home. Right now the trick is getting them big enough to transplant in the limited space I have. Last and certainly far from least are the zucchini. Both seedlings have about a billion new leaves and branches, and I'd swear that I'm seeing the first blossoms on the stems, though I suspect those are just more leaves and branches ready to grow. One of these will be going to its new home very soon, I suspect. And so that's that for the Stepford Plants this week. Hopefully the yard will dry out enough for a mow soon, and I'll get some more staples for the bird netting, and maybe even another package of bird netting, although I'm not convinced I need that yet. I'm still thinking at least a couple of these plants will be in the ground outside very soon.